This is the full VoiceShield kit. It is easy to build with only though hole parts. 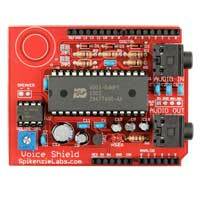 A great project for any one that wants to make their Arduino project "Really talk". It has all the parts needed to build a VoiceShield. You just add your own Arduino and either a basic 8 ohm speaker or powered speakers.